The Galaxy S lineup is no stranger to versioning - the original Galaxy S relied on half a dozen different editions to achieve its market success. Its successor will obviously take a similar path as we just got its first body double in the face of the Samsung I9103 Galaxy R. With Tegra 2 stepping in for the Exynos chipset and SC-LCD taking the place of the new generation SuperAMOLED Plus, the Galaxy Z should be covering for the cases when the Galaxy S II is just slightly out of budget, while at the same time saving on the precious AMOLED panels. Update 12 Jul: Shortly after this preview was published we were contacted by Samsung, who clarified that the handset will be available in most markets as Samsung I9103 Galaxy R. We've fixed the preview accordingly. 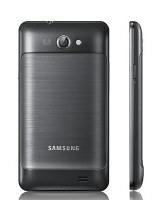 Now, the Samsung I9100 is obviously a winning formula so Samsung should be extra careful with any changes that it introduces. Tegra 2 is a fine alternative to Exynos and we already know what kind of performance to expect. We’ve seen the switch to SC-LCD before – with the I9003 Galaxy SL. With the numbers the SuperAMOLED Plus packing I9100 is selling, it’s no surprise that Samsung will try to sell a few units that don’t use up their scarce SuperAMOLED recourses. We’ve summarized the specs of the Samsung I9103 Galaxy R to get you acquainted with the device quickly, so we can move on to the fun stuff. Clearly, the I9103 Galaxy R is meant as a companion of the I9100 Galaxy S II – early pricing info also suggests that the two belong to different market segments. We would have liked an 8MP camera and 1080p video capture, but if sticking to the 5MP/720p camera specs means we can munch on Gingerbread for less cash than the S II would cost, then we won’t complain. After all, the original Galaxy S had a similar camera module and we’re quite pleased with it. Before proceeding further, we should point out that we’re using a pre-production model of the Samsung I9103 Galaxy R and the hardware might change before the design is finalized. The software looks identical to the one in the I9100 Galaxy S II, so that probably won’t see much (if any) changes. Further optimizations to suit the new chipset seem likely though. It may not have the slender, 8.5mm frame of its big brother, but the I9103 Galaxy R is a good looking device. Join us on the next page, as we do a proper inspection of its hardware. Gsm arena is awesome , mindblowing ... Superb ... But der was no price tag mention in the discription .